Diese Seite bietet Informationen über Vat Phou Cruise. Originally a ferry that carried teak wood between Vientiane and the south of Laos, the Vat Phou boat was lovingly converted in 1993 into a luxurious floating hotel. The Vat Phou boat is a 34 meter long, 7.5 meter wide steel hulled teak barge, equipped with two 260 HP Isuzu diesel engine. 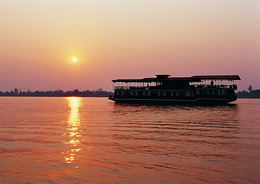 The Vat Phou boat has 12 elegant twin shared cabins, each with a view over the southern Mekong River. The design retains a character that is unmistakably oriental and enables you to relax in comfort while you enjoy the ever changing pageant of river scenery and life as you pass smoothly by. We have 15 staff on each cruise departure. This includes 2 full time captains, 2 mechanics, 2 cooks, 3 cleaning staff and 5 bar or waiting staff. We also have on board an English, French and Thai speaking guide who can help answer any questions and point out any interesting sights along the way. The front upper deck has rattan armchairs, sofas, coffee tables and loungers. This area is perfect for lying reading a book, taking photographs of life along the river or having an afternoon nap. 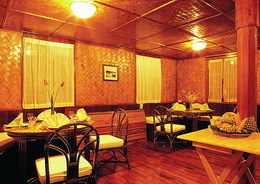 The Vat Phou boat has two areas where meals can be served. We usually serve the breakfast and lunch upstairs on the rear deck so you can continue to appreciate the view while you are eating. We have an air-conditioned room downstairs for our evening meals. All meals are included on the Vat Phou cruise and galley produces the finest of Laotian, Vietnamese and Thai dishes, lovingly prepared and beautifully presented. If we believe the feedback forms, the Vat Phou cuisine is enjoyed by all.